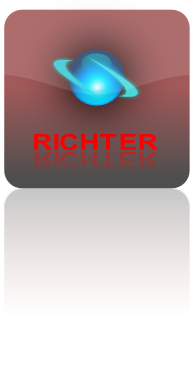 RICHTER ENTERPRISES CORPORATION provides 2 principal families of manipulators: battery powered Suction Cup Frames for mobile applications and stationary workplace manipulators, suspended by JIB or Gantry Stile Cranes. 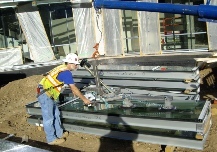 The picture shows our battery powered vacuum cups used at a installation of a glass building envelop. The suction cups are also used for the installation of larger solar panels on roofs. 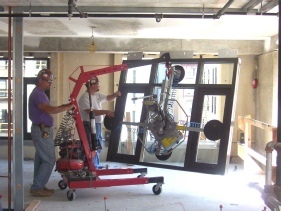 A motorized tilting mechanism places the panel in the desired angle at the push of a button and holds it in place for easy installation. A solar panel can be installed at any inclination of the roof or mounting frame. Easy pick-up of panels from a horizontal or vertical shipping container. 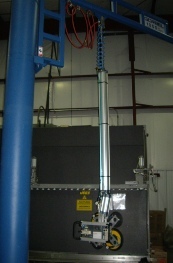 Workstation Manipulators apply an pneumatic cylinder for hoisting and are typically suspended off JIB or Gantry Stile Crane Ways. The picture shows a manipulator at the end of an IG-line.